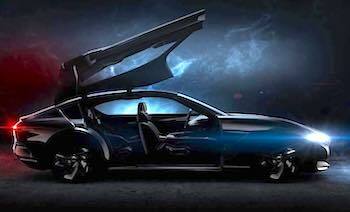 With the release of a pre-show teaser image today Pininfarina has offered a good look at its Geneva-bound HK GT concept, the fourth design exercise for a micro turbine electric range extender car it is conducting for Hong Kong based Hybrid Kinetic Group. The micro turbine is small in size and light in weight, around one-third to one-half an internal combustion engine while this option offers smooth operation with very little vibrations and no need for lubrication when the air bearing is used. Added to that is long life, around 20,000 hours of maintenance-free operation and up to 30 years of life when used as range extender. It’s cheaper to manufacture than an internal combustion engine as it comprises of less than 40 parts and weighs only 91kg for a 60KW system. Hybrid Kinetic Group’s take on future motoring needs is focused around using a micro turbine power generator that works at a fixed rate of high efficiency and low emissions and is capable of running on multiple fuels including petrol, diesel, natural gas, hydrogen, bioethanol and propane. That works in harness with battery technology and a system of high power and high charging-discharging rate. One year after the global debut of the luxury sedan H600 concept at the 2017 Geneva Motor Show, followed by the unveiling of the five seater SUV K550 and seven seater SUV K750 at the Shanghai Motor Show last year, Pininfarina will present the HK GT	at	the 88th edition of Geneva	Motor Show which opens next week. All four of the concepts will be on display in Geneva. The HK GT adds a "gran tourer" option to the proposed line up while further expanding the design language Pininfarina has been developing for this proposed brand into a new direction. With a long flowing bonnet and a classic touring cabin that flows onwards towards the rear, the most distinctive feature to be revealed today is a long gullwing side door that comes in one piece for both front and rear seated passengers, That striking door is dominated long glass window. 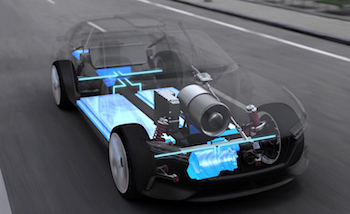 Hybrid Kinetic Group’s take on future motoring needs is focused around using a micro turbine power generator that works at a fixed rate of high efficiency and low emissions and is capable of running on multiple fuels including petrol, diesel, natural gas, hydrogen, bioethanol and propane. That compact turbine works in harness with battery technology and a system of high power and high charging/discharging rate. When the vehicle is cruising, the on-board HK graphene enhanced LTO battery can store any excessive power. The turbine is small in size and light in weight, being around one-third to one-half that a similar application internal combustion engine while this option offers smooth operation with very little vibrations and no need for lubrication when the air bearing is used. Added to that is long life, around 20,000 hours of maintenance-free operation, and up to 30 years of life when used as range extender. It’s cheaper to manufacture than an internal combustion engine as it comprises of less than 40 parts and weighs only 91kg for a 60KW system. The Hong Kong company isn't going to be starting from scratch building cars as it currently has an automotive division that builds electric buses that are developed on MAN architecture.